The legal clinic is organized by the Hispanic Bar Association of Pennsylvania, the Toll Public Interest Center at the University of Pennsylvania Law School, The Vanguard Group, Unidos PA'PR, Ceiba, and the Philadelphia Bar Association. More than three months have passed since Hurricane Maria lashed the 3.4 million American citizens living in Puerto Rico with sustained winds of 155 MPH, yet most of the island (which is only slightly larger than Connecticut) is still without electricity, making this blackout the largest major power outage in US history. Without electricity and crucial amenities, many people are fleeing Puerto Rico out of necessity. Pennsylvania is a major destination for evacuee; a recent report by the Center for Puerto Rican Studies at Hunter College estimates that more than 56,000 Puerto Ricans are expected to evacuate to the Keystone State before 2019. A Disaster Assistance Center set up to help Puerto Rican evacuees coming to Philadelphia helped more than 2000 people between October and December. • Calling Ceiba at: 215-634-7245. Victims of Hurricane Maria have until March 20, 2018 to file a claim with FEMA and 60 days to appeal a denial by FEMA if they filed a claim and were denied disaster relief. 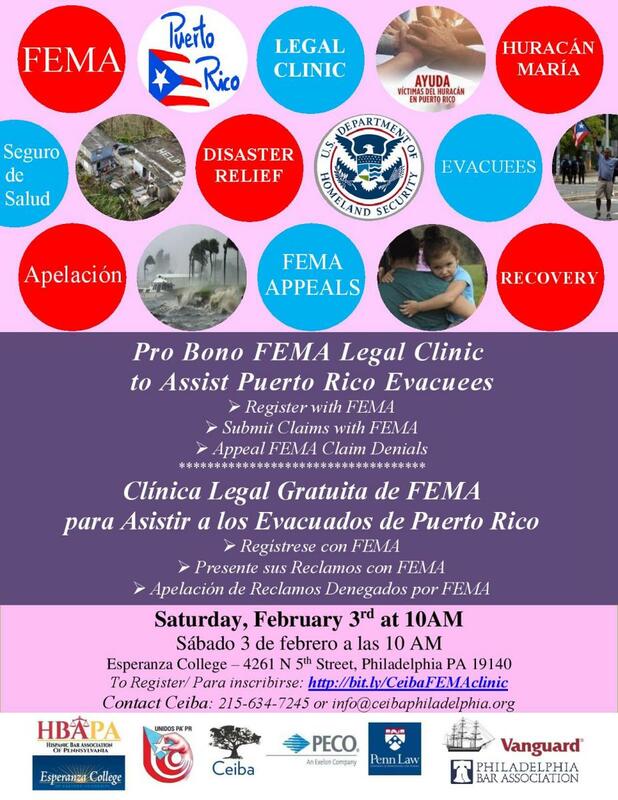 For more information about the Pop-Up Pro Bono FEMA Legal Clinic please contact Ceiba at 215-634-7245.